Relentless rains and scorching rays are your two worst enemies outdoors. A retractable awning is your ally in the war against the elements. The right shade solution will shield you from the weather’s worst, giving you more reasons to spend more time on your deck or patio. 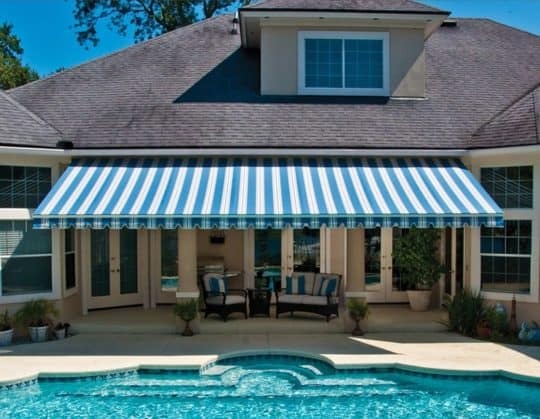 At Paul Construction, we carry a wide range of high-quality awnings, and each is designed to provide superior protection through all four seasons. Need inspiration? Browse through our pictures of awnings on houses by scrolling down or visiting our portfolio here. For more than 25 years, we have helped people transform their outdoor spaces, turning tired back yards into elegant entertainment areas. Besides installing awnings, we also specialize in professional hardscaping. Call 610-287-1623 to start your project. The Sunesta is a large retractable awning that can project over 14 feet. 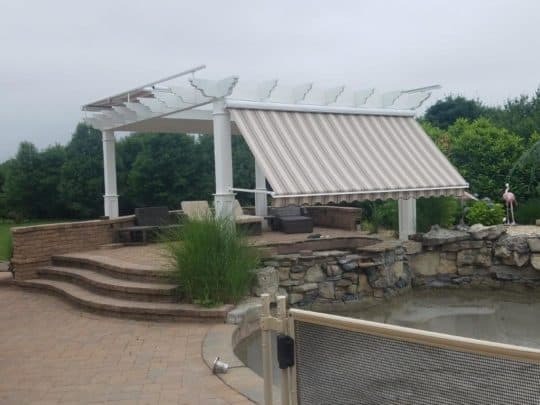 Available in widths up to 40 feet, this awning is available in 150 different fabric styles that include a variety of different colors and patterns you can mix and match to find the perfect fit for your home and landscape. Our pros will evaluate your property and advise you on the best size, style, and features to suit your needs, budget, and space. At Paul Construction, we believe in creating and erecting enduring structures that can stand the test of time. The Sunesta features a 10-year warranty on the fabric and a 5-year warrant on the motor. The Sunstyle projects out almost 12 feet and provides 40 feet of shade width-wise. It features four different frame color options and a plethora of fabric style choices. 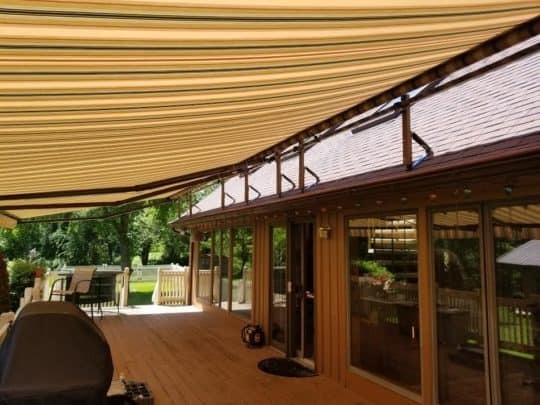 This is the perfect shade solution for homeowners who need a customizable awning that provides superior coverage for smaller decks and patios. With 10 feet of projection and over 24 feet of horizontal coverage, the Sunlight is great for smaller spaces. At Paul Construction, our certified installers have the experience, tools, and knowledge to ensure your new awning is installed safely and correctly, preventing collapse or failure down the line. Now that you’ve had a chance to browse through pictures of awnings on houses and found out more about our products, it’s time find the perfect awning design for your needs. To speak with one of our awning experts, call 610-287-1623 today.